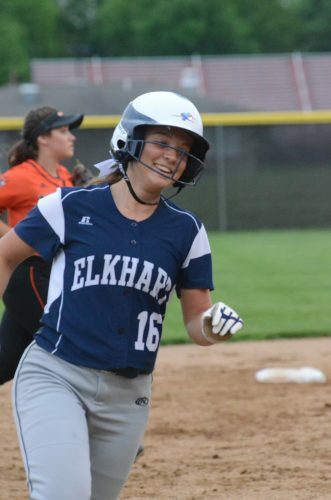 Abbie Tyler of Elkhart Central is all smiles as she rounds the bases after hitting a two-run homer. Tyler’s blast was the difference as Central beat Warsaw 2-0 in the Elkhart Memorial Sectional Tuesday night. 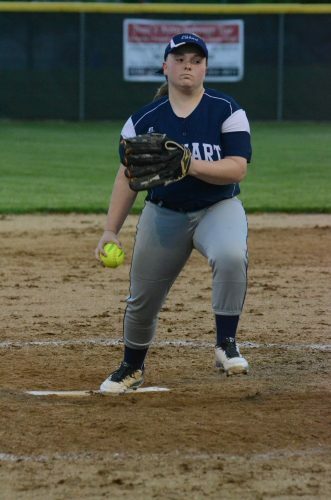 ELKHART – The Warsaw softball team played well enough to extend its season Tuesday night. One big swing of the bat by Elkhart Central’s Abbie Tyler put an end to the Tigers’ campaign though. Cleanup hitter Tyler crushed a two-run homer as the Blue Blazers sidelined Warsaw 2-0 in a first-round game of the Class 4-A Elkhart Memorial Sectional. The blast over the left field fence on a 2-2 pitch with two outs in the third inning sends Central (10-16) on to a semifinal contest versus Goshen (13-12) Wednesday at 5:30 p.m. Central topped Goshen 7-5 in a regular-season contest. Goshen edged host Memorial 3-2 in the sectional opener Tuesday night on an RBI single by senior Elkah DeVoe in the sixth inning. The RedHawks had just two hits off Memorial freshman Leeah Wade in the win. Freshman Brynn Shoup-Hill got the pitching win for Goshen, which beat Memorial twice in NLC regular-season games earlier this season.. The second semifinal Wednesday at approximately 7:30 p.m. pits Concord versus defending champion Northridge. The Minutemen and the Raiders split a pair of regular-season meetings to share the NLC championship at 13-1. The title game at Memorial is set for 6 p.m. Friday with the winner advancing to play at the winner of the South Bend Sectional in a one-game regional on May 29. Tyler, a junior catcher for the Blue Blazers, hurt the Tigers with her big bat for the second time in a week. She also crushed a three-run homer on May 15 as Central rallied from a 5-0 deficit to beat Warsaw 9-5 in a regular-season game at Central. 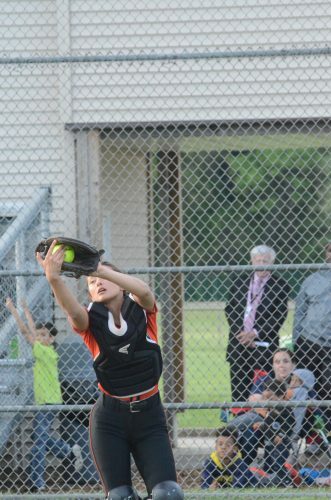 Warsaw catcher Katie Anderson grabs a popuo. Warsaw sees its season end at 10-15 despite playing a strong all-around game. 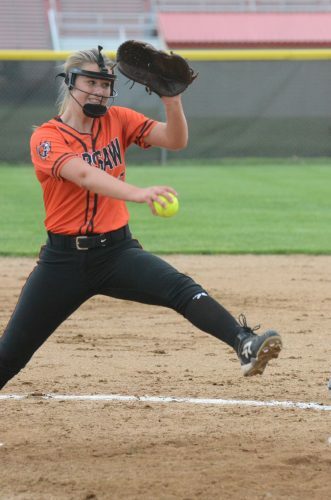 The Tigers did not commit an error, but managed just two hits off Central pitcher Lilly Fann. The senior, who did not throw last week versus Warsaw, allowed just an infield single by freshman Lindsey Bradley in the fifth inning on a rocket shot off the Central third baseman and a two-out double to junior Courtney Chookie with two outs in the home half of the final frame. Warsaw pitcher Chookie allowed just five hits, with two of those being infield singles. The junior struck out five and walked five. “It was a good game all the way through,” said Warsaw coach Kevin Dishman. “We’re disappointed to not be moving on, but all in all we played well tonight. I was proud of how we played and how our girls stayed with it the entire way. Tyler’s shot came after senior Sabryna Stanley drew a two-out walk. Fann retired the first 12 Warsaw batters of the game. The diminutive right-hander, who boasts a herby-jerky delivery, got a pair of stellar defensive plays from centerfielder Stanley. She made a diving catch in the bottom of the first and then a great stab of a liner hit over her head for the first out of the final inning. Fann finished with three strikeouts to go with one walk. 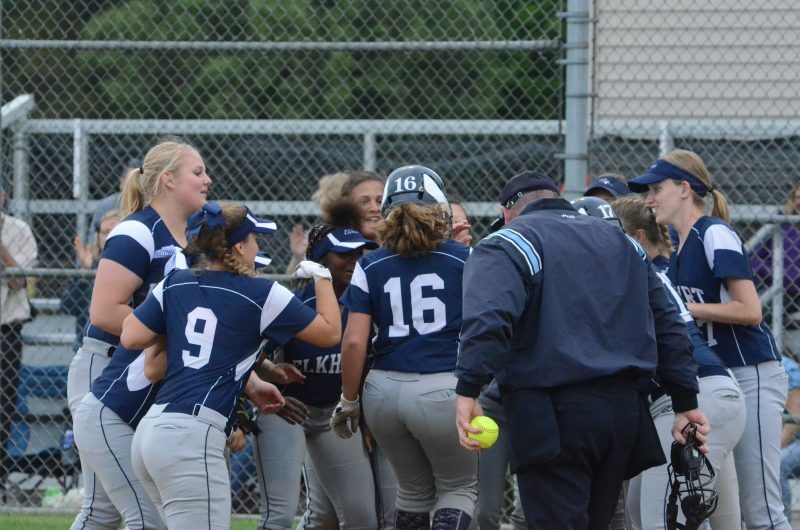 The Central team congratulates Abbie Tyler after her home run. Tyler led the Central offense with two hits. The Tigers also flashed plenty of leather in this one. Centerfielder Emali Grose made a tremendous diving stab of a shot in the second frame. Shortstop Izzy Dittmar ended the top of the seventh with a gorgeous unassisted double play of her own as she snared a liner just off the ground and raced to third to double off a runner there. The Warsaw defense was outstanding even without the talented glove of Adara Frey. The junior, who normally starts at third base, missed the final three games of the season due to an ankle injury suffered versus Elkhart Memorial last week. Madison Lane stepped in and played outstanding at third Tuesday night for the Tigers. The Tigers got out of first-inning jam after Fann singled and junior Sienna Eby drew a walk to open the game. Chookie got a popout, a fielder’s choice and a strikeout to end the threat. Warsaw will say good bye to two seniors in starters Saylor Bradley and Grose in the outfield. Courtney Chookie of the Tigers. Lilly Fann of the Blue Blazers.